Cost: Under $3.00 including the hardware! This device takes only a few minutes to make. 1. Start with a short piece of PVC pipe. 2. Drill a hole through both sides of the top and bottom. 3. Insert a stainless bolt with lock nut through top and bottom to keep treats like a mini banana with the peel or a large chunk of produce from falling out or from being removed by the macaque too quickly. 4. 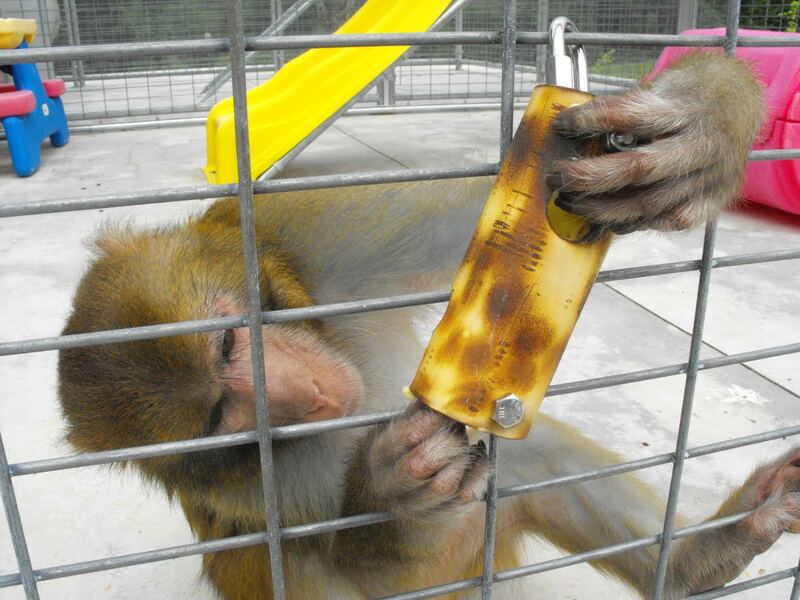 Drill larger holes in random places around the tube so macaques can access the treat inside with their fingers. Note: Drill the holes larger than their fingers but smaller than their hands to prevent fingers or hands getting stuck in the holes. 5. You can put a variety of treats in the tube like mini bananas, peanut butter smeared on the inside of the tube, or even large apple chunks. 6. This device will easily hang on any cage. Simply attach a quick link to the bolt at the top and then attach quick link to the caging. We’ve been using these feeders for a couple years, and the macaques never seem to lose interest!